Our era will be remembered for the triumphant march of a globally unifying rightwing – a Nationalist International – that sprang out of the cesspool of financialised capitalism. Whether it will also be remembered for a successful humanist challenge to this menace depends on the willingness of progressives in the United States, the European Union, the United Kingdom as well as countries like Mexico, India and South Africa, to forge a coherent Progressive International. Our task is not unprecedented. Fascists did not come to power in the mid-war period by promising violence, war or concentration camps. They came to power by addressing good people who, following a severe capitalist crisis, had been treated for too long like livestock that had lost its market value. Instead of treating them like “deplorables”, fascists looked at them in the eye and promised to restore their pride, offered their friendship, gave them a sense that they belonged to a larger ideal, allowed them to think of themselves as something more than sovereign consumers. Yanis, this is at best a strawman, based on a false analogy, or a case of gaslighting about motives. 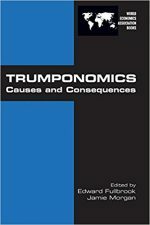 Fascism today is more like mandatory vaccinations in Italy with huge financial penalties for non-compliance (now repelled by a ‘nationalist’ newcomer), like Bayer, Facebook, Google and the banking cartel, like identity politics of the social justice ‘movement’, like explicit misandry and professional victimhood of the feminists, like suppression of free speech by ‘Fact-Checkers’ and the political censorship by the Social media capitalists, and finally, it is more like forced mass immigration into Europe from medieval, theocratic cultures by faceless beaurocrats of the EU and the UN. It is more like perpetual war against secular democratic tendencies in the Middle East (from Libya to Syria) under the guise of liberation, but really only to ensure that those weaponised migrants keep moving West. It is more like ideological homogenisation of the masses by systematic and forceful normalisation of abnormalities under the guise of ‘diverstity’ (but not ideological diversity, of course). In a nutshell, fascism nowadays entails democracy for the the biggest companies in the world, and socialism, surveillance and total suppression of dissent for the masses by whatever means, striped of their unifying culture for the sake of atomistic ‘humanity’, which is actually a form of anti-humanism. You had your chance to resist the global banking cartel, but you blinked and ran, and now you whinge from the sidelines about ‘fascism’ of those who are willing to oppose forced globalisation. The real fascism is already global and globalist in its essence. Seems to me that the thing both the culture of finance capitalism and cultural marxism have in common is their arrogance, intolerance and intellectual rigidity. And of course the solution to their mutual character would be an economy, money system and culture based on the various aspects of the natural philosophical concept and self actualized experience of grace. I take you mean Grace in the sense formulated by Simone Weil. In that case it is indeed not something that can be generated through gaining rights, political movement; it cannot be given, it is not a right, but can only be earned precisely by rejecting the kind of high moral ground, ideological conviction and self importance of cultural Marxists. Being subjected to Injustice is in fact a way to test your grace, to endure it without resentment. This also reminds me of Nietzsche and his criticism of the culture of ‘resentiment’. Funny how those who self-identify as progressives (overlooking the presumption that their particular ideologies are indeed ‘progressive’, is more akin to Weil’s/Nietzchean idea of ‘gravity’, while ‘grace’ is way too fascist for them primarily because of its demand for individual respinsibility and moral burden. A Socialised burden is so much easier to bear. My point was that they are both riven with arrogance and victimhood. Grace as in the complete integration of opposites to the point of thirdness greater oneness is an ultimate ethical strength not the mere reactionary nonsense that permeates both of those ideologies. As I advocate Direct and Reciprocal Monetary Grace as in Gifting which is a thirdness of Distributism hence I’m free to objectively examine both the RE-distributism of socialism and the problematic monopoly monetary paradigm of Finance Capitalism, namely Debt/Burden/Cost Only….and both of their ethical failings as well. Socialism IS more humane than Finance capitalism. The problem is it (socialism) is a palliative. And when an actual solution to the deeper problem at the base of both is available, namely the new economic and monetary paradigm of Direct and Reciprocal Monetary Gifting….a palliative cannot be viewed as an ethical choice. It always was, it is now, and it always will be. Worse is yet to come but with a huge difference, as most of the plant, including what it contained has already gone to waste. It’s very easy to appear on television and to preach to the converted, but to survive the current state of being is the real test. Let us see how many of us can survive it. Are we to undo the EU, to return maps to an earlier model? If so, how will trade flow, as all nations have border agreements with all with whom they wish to cross with money, people, tangible products, intangible intellectual property & human services. Corporations may be bad, but do they change with new national boundaries? The same might be asked about governments & indeed we individuals, it seems to me. I hope Varoufakis knows with whom he’s dealing when he attacks “a globally unifying rightwing – a Nationalist International.” Those who created “the cesspool of financialized capitalism” out of which Varoufakis claims this new “Nationalist International” sprang aren’t concerned with the deceit, scapegoating, undermining of democracy, and warfare for profit and power Varoufakis lays at the feet of this new movement. When these financial wizards are not giving lots of money for white supremacists, they’re counting their money. In their view rightists are one of the tools used to protect their money and status. So, my point is these rightists are dangerous. According to the Southern Poverty Law Center (SPLC), “alt-right,’ is a set of far-right ideologies, groups and individuals whose core belief is that “white identity” is under attack by multicultural forces using “political correctness” and “social justice” to undermine white people and “their” civilization.” SPLC goes on, “At the heart of the alt-right is a break with establishment conservatism that favors experimentation with the ideas of the French New Right; libertarian thought as exemplified by former U.S. Rep. Ron Paul (R-Texas); anarcho-capitalism, which advocates individual sovereignty and open markets in place of an organized state; Catholic traditionalism, which seeks a return to Roman Catholicism before the liberalizing reforms of the Second Vatican Council; and other ideologies.” There is literally no way to achieve such radical and world-wide changes without murdering at least half the world’s population. The right seems unaffected by that potentiality. I certainly am not averse to shooting back. Wouldn’t be the first fascists I’ve shot. Agreed, Ken, as the Koch brothers will just fund another enormous project to crush this upstart, the Nationalists will claim foreign intervention and the KKK remnants will check out the color of everyone’s skin before sun tan. James, you got it. James Madison and Alexander Hamilton are correct. The control and use of wealth are the most dangerous faction in a democracy. We’ve now run the course of denying this faction, of hoping it won’t kill democracy, and watching as it rips our democracy apart. Frankly, it may be too late to stop it now. Ken, I think it will take a monstrous economic crash to take the wind out of their sales. Their arrogance comes from their ability to control government, the press & to otherwise to advance their personal interests. Most likely using Russian money, the current President can attempt to pay off any inconvenience…like Stormy Daniels. James, it seems the opposite to me. Economic crashes give wind to their sales. Their arrogance and power are in large part a result of being treated as someone with power and importance within their civilizations. They are given dispensation to act and react in any way they wish. Ken, if you examine what happened on Wall Street in the late 1920’s & into the 30’s, entire families were destroyed economically as I found when I went to an Ivy League school at the end of the 1950’s. The later giants of Wall Street were mostly a newer swath of financiers, often drawn from New York public universities. In other words, if you had big debts & dwindling assets a natural reaction was to retire, perhaps with a bottle. I once did research on the subject, but I kept running into Eastern families who had lost “everything”–and whom I knew well from one or another setting. Again, a slice of life. James, I’m just looking at the information published by Forbes. 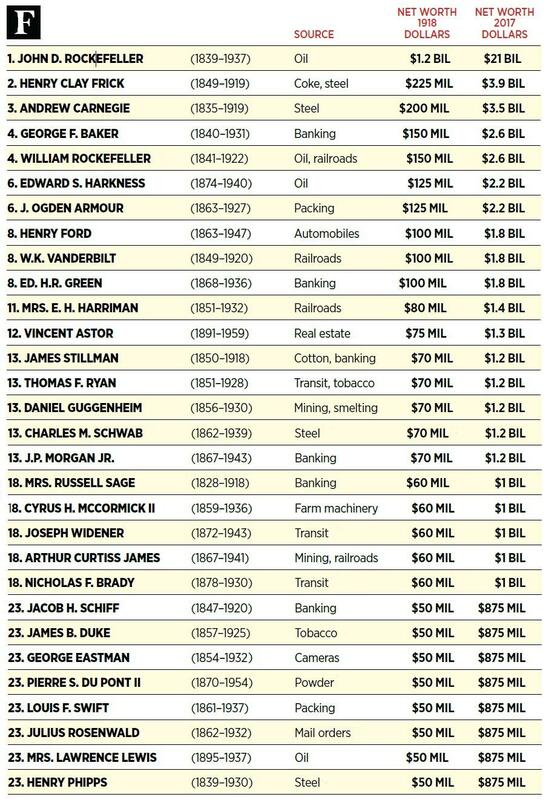 This table shows the richest American families in 1918 prior to the 1929 economic collapse. None of these families has been destroyed financially. But a list of other super rich has been added since 1918. This list, also from Forbes shows this new list of the super-rich. These lists show how the actions of the super-rich have changed, but not the wealth of the super-rich. Most of the older rich families now operate charities, are philanthropists, create museums and other public spaces, etc. While the new rich pursue wealth with a ferocity just as intense as their older counter parts. Hi, Ken, according to Wikipedia there are 2,754 billionaires in America today–many of them in the same family, obviously. This, however, is more than a 100 times your figure of an earlier group: ttps://en.wikipedia.org/wiki/Billionaire. My point was about LIFESTYLE, however, as many families had a lot of depreciated stock, real estate & portable babbles such as vintage autos & boats. These didn’t lead to much of the Great Gatsby living attributed to the 1920’s & which began to strike us again in the 1980’s in New York among other places as I recall. Mr Trump was in this Gatsby II group. I was long out of Princeton but I had classmates who had made it big on Wall Street. Interestingly, schoolmate Jeff Bezos found his way to Wall Street when he graduated in 1986. James, the number from Wikipedia sounds about right. I understand your points, I think. The wealthy families from the first list did suffer some loses due to the 1929 collapse. But none were severe enough to move these families from super-rich to even ordinary rich. These families are conservative in protecting their own wealth. The invention of national or even local economic indicators did not begin until the 1930s. But still economic inequality was discussed widely as the nation hurdled toward its date with depression in 1929. By one estimate the wealthiest 1 per cent of the families of the nation in 1910 owned about 4 7 per cent of the national wealth, and each year received about 15 percent of the national income. The Great Depression increased this inequality. Bu the 1920s were much more than just the road to the Depression. The 1920s, a period of sustained economic prosperity with a distinctive culture made up of social, artistic and cultural dynamism. So much so that in Paris it was called the “crazy years.” At the same time technology was advancing at a break neck pace. Also, during this period an entire generation in the West was traumatized by World War I to the point that Gertrude Stein named them the “Lost Generation.” Politics and politicians during the period were conservative, however. Perhaps to counter the crazy parts of the era. The 1980s were out of sorts but not in any way like the 1920s. Avarice and selfishness were part of the 1920s. They were all for the 1980s. Right on, Ken, as the 1980’s saw new faces & family backgrounds in Wall Street workers, as well as new ways of gathering funds & repackaging these. Hedge funds became a far larger part of the repackaging in the 1980’s, even as derivatives seemed to many like easy money. The 1920’s were about living wildly, while the 1980’s among the money-handlers was a bit more about vast increases in notational wealth. The 1920’s were an abrupt change from the war-laden years before, while the 1980’s continued the surge in expenditures upward, it seems to me. James, good summary. During the 1920s lots of people celebrated in crazy ways just to revel in being alive. World War I was devastating physically in terms of the soldiers and civilians killed/injured. Also, the War devastated society by how the killings and injuries were done. Blitzkrieg is the first military tactics to fully utilize the ever-growing new technologies of war (e.g., machine gun, gas, tank). Blitzkrieg was invented in WWI. It exponentially increases not only the number dead but more importantly the number of non-fatal wounds; with which medicine at the time could not effectively cope. The psychic shock of seeing hundreds of thousands of funerals and after the war thousands of soldiers missing legs, arms, faces, and worse was difficult to accept let alone cope with. Partying was the alternative to madness. Only 20 years later Europe would do it again, only this time killing and wounding even more. Interesting to note that comparatively speaking Americans suffered few killed or wounded in either war. Maybe that’s part of the reason Americans still today seek war and glory. Still don’t believe Americans have learned the lessons of the slaughter and societal collapse of WWI and WWII. Culturalanalyst wrote of Varoufakis: “You had your chance to resist the global banking cartel, but you blinked and ran”. While away I had the chance to read Yanis’s “Adults in the Room: My Battle with the Europe’s Deep Establishment”, 2017, the Bodley Head [Penguin/Random House]. I seems this comment is completely injustified. As I gathered at the time, it was the Greek Prime Minister who blinked, a banker’s plant having given the banking Troika advance warning of Yanis’s every move. Not that I was entirely happy with Yanis’s strategy, any more than I am with Mrs May’s and Ken’s apparent willingness to sacrifice 50% rather than the errant 1% of us. There is another alternative, and that is to spread understanding of what money really is and of the fake authority fake money has bought. A “Top Post” up right says “If poor people knew how rich rich people are there would be riots in the streets”. If everyone know how much rich people owed and had to earn or pay back, we’d be sorry for them and they’d be sorry for themselves. While I agree that Yanis’ exit was better than open submission to the Troika (as Tsipras did), he could have stayed his course until officially sacked. He could have remained within as a dissenting voice. Off course, we don’t know what threats were made behind closed doors, and everyone has a family to protect…. culturalanaysis, living in the country which loaned a lot to Greece to purchase German-made military equipment, I have always felt that moneyed Greeks controlled enough of the politics so that Yanis didn’t have a chance. Whenever anyone blames outsiders, I have found it best to first to examine the mistakes and/or weaknesses of the insiders. Using a familiar example, Germany couldn’t advance under the burden of reparations after WWI, and the domestic politics was inadequate. So it took a near-German, but nationally an outsider, in Hitler to get things moving again–temporarily. Who has created the Euros lent to Greece? Genuinely curious, ECB, German banks or all euro denominated banks collectively? This is important. I think it is wrong to blame the Greeks for the crisis. The Greeks were the same Before euro as they are now, no great work ethic or honesty with taxes, so by taking them into Euro the cards were on the table. It was a ploy that Germany and France knew would ultimately let them own Greece. The Crisis was to be expected, inevitable, and therefore planned from the start. Sure, the Greeks are responsible to a degree for being too self absorbed (or unable) to deal with elite corruption, but the Troika has blood on their hands too and is more culpable on account of their expertise and economic superiority. Hi, culturalanalysis, have you spent time with Greeks & the Greek movers-&-shakers? If you have, you know like everywhere else there is a group (“class”) of educated/affluent professionals & business people. I have studied under some. My point was that their social connections & collective wealth meant everything in a rather poor but very historic & fabulously beautiful country. There are no national “people” if I may as an anthropologist point out, but groupings of folks with similar outlooks/behaviors. There were no Inca people, nor even Navaho, but rather due to population size and/or dispersal, groups which were quite similar. Dialect is one test for cohesiveness used by linguists as you may be aware. 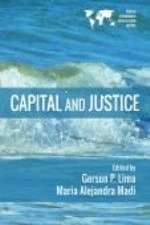 Investigate the large military & infrastructue sales to Greece in past decades. Then check into who lent most of the money, although some loans were syndicated with banks from more than one nation. Cultural conditions aside, I wonder how much of those lones were just bank credit. This is important since credit does not entail a complete transfer of purchasing power, therefore is not strictly speaking a loan. Hi, culturalanalysis, you make a valid point, I agree. Dave, I’m not the one “sacrificing” half the world’s population. Assuming the peoples of the world don’t simply surrender to the globally unifying rightwing Nationalist International named by Varoufakis, the result is likely to be some form of warfare. The public face of the rightwing international is rather intellectual and passive. This public face has some “behind the scene” associates are neither intellectual nor passive. They like bombing, lynching, and other extreme violence. These are the murderers with the violence to kill anyone opposing the rightwing Nationalist International. Riots in the streets of ordinary citizens are just a hunting ground for these killers. Ken: figures of speech! My point is you are looking at likely outcomes rather than alternatives which might avoid it. Culturalanalyst’s question as to why the starving majority do not steal is of course very apt. I’m seeing fear of the authority and power of the law of the majority right-wing government (word rather than evaluation directed: see my response to Fonseca-Statter on Kant). The answer to that is that such people have no more authority than anyone else: only a right to advise from their point of view. I’m fishing for words here, and apologies for the fish not being entirely out of the water. Dave and James don’t really disagree with you. Even in the worst of times during the Nazi take over of Germany, some Germans did resist. And many were killed for it. But what eventually shut down the Nazis, the death camps, the war machine, and the deportation of “undesirables” by Nazi Germany was the armies, air forces, and navies of the allied nations. German resisters showed the way to take down Nazism, but they could never finish the job. You and I can resist but we cannot take down the new fascism Varoufakis describes. That requires more strength and unity to force changes in how Nazis act and are reacted to. As to businesses and companies being given a pass due to their usefulness for taxes and donations, I don’t buy it. German businesses and companies, as reactionary as many were could not despite there best efforts control the Nazis. Even the American and British businesses and companies who worked for/with the Nazis were manipulated and not paid. Ken, national “healers” will be elected first. If they can’t do it, there will be violence, I expect based on historical examples. Currently, we are informed that the likely President of Brazil may be some sort of leader of the people. We have yet to see if the same term can be applied to Mexico’s new president. The governments of Hungary & Poland are self-serving, looking for votes based on nationalism and perhaps some benefits to the aging (Poland). Both need the support of business for taxes & donations. No one will drive business out as it is a goose laying bountiful golden eggs, except perhaps in a few places like Venezuela where not enough business is allowed to flourish. Or so it appears to me. Dave, right on about the rich, whose major assets are based on wildly inflated stock & housing values. These folks smile, saying that they live well so who’s to worry about fundamentals. Recall the stories about Wall Streeters jumping out of buildings following the 1929 crash? I suspect they mostly came from a well-churched era when people worried about repaying debt. Does anyone here know what Diem25 propose to do about fractional reserve banking? Without addressing this point all their moralising is just smoke and mirrors. is it about time to get rid of the corrupted political “eclecticism” to a new model of creative thinking project.